The Christian School on the island have been doing a project on Harris Tweed, so I bribed asked politely my American, Pennsylvanian, Northern friend, who is teaching in the school for a few months to tell me all she's learned about Harris Tweed. Laurie, tell me a bit about the history of Harris Tweed. 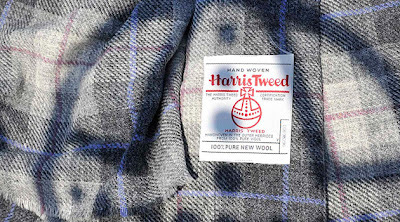 People had been weaving cloth in Harris for hunderds of years, but when the widow of the Earl of Dunmore, who'd inherited the northern part of Harris, took over the running of the estate, the birth of Harris Tweed as we know it was to occur. Lady Dunmore realised that the cloth that two sisters, who are known as the Paisley sisters, were weaving was ideal for making jackets that were both wearable and durable. When she had jackets made for her own estate gamekeeper and ghyllies, Lady Dunmore knew that this clothing would suit her well-off friends in London, and on other estates, to a tee. She took samples to London, and with her encouragement it was not long before tweed jackets had become the clothing for the hunting, shooting set, including those working for Queen Victoria. It was not only practical, it was really the clothing to be seen in. I took a drive down to Harris and saw where these ladies had lived and worked. This plaque commemorates the 'Paisley Sisters', Marion and Christine MacLeod. In the foreground is the remains of Marion and Christine's home. Here is the house from another angle. See how close it was to the sea! They would have washed the wool in this stream of running water, right bside their home. Here is crotal, the lichen that was used to dye the wool. 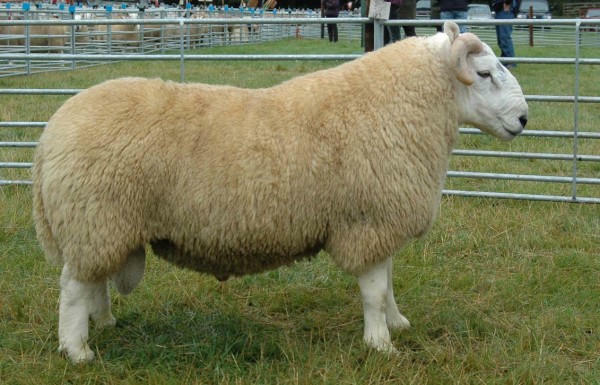 The raw material, wool, was produced locally and part of it would have been used in its natural uncoloured state, the rest was dyed. In the 19th century vegetable dyes were used. Following dyeing, the wool was mixed, the shade being regulated by the amount of coloured wool added; then it was oiled and teased; the latter process involves pulling the wool apart to open out the fibres. The next part of the preparation, carding, results in the fibres of the wool being drawn out preparatory to spinning. This was a very lengthy process followed by spinning carried out on familiar spinning-wheel by women. Until the turn of the century a very early type of handloom was used for weaving with a manually operated shuttle. The final process is finishing where the tweed is washed and given a raised compact finish. The involved in this process was often accompanied by songs in Gaelic. Harris Tweed is cloth that has been handwoven by the islanders of Lewis, Harris, Uist and Barra in their homes, using pure virgin wool that has been dyed and spun in the Outer Hebrides. - the wool must be dyed and spun in the Outer Hebrides. 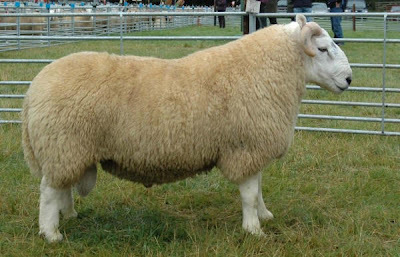 Originally the wool used on the island was from Blackface sheep, but now the wool comes to the island mills from the mainland, from Cheviot sheep. The wool comes to the island mills, all ready washed. The dyeing, carding and spinning is all done in the island mills. The mill then take the various yarns they have warped and prepare a beam for local weavers. The local weavers, weaving from their own homestead, put their delivered beam onto their own looms and weave the required length. The Harris Tweed industry has been a mainstay for the island's economy for the past century. My dad had a business in the town here until he retired, and he always said that he barely noticed when other industries were busier or quieter, but when the 'tweeds' were on a downturn, the whole town was affected. Tomorrow, I'll show y'all one of our local weavers at work, and try and show you how the loom actually works. Cool, Anne! Thanks for sharing about your island. I love learning this history!! Wow! O my goodness! I loved this post! I can not wait to see how the loom works and how they weave. :) Thank you for a lovely little step into the history of your home land. Great information! It's all very interesting! My daughters and I are learning about spinning...and hoping to learn the other processes that are involved in the fleece becoming yarn..(not sure if we'll get to the weaving process!) Looking forward to seeing your local weaver! Very interesting! It's fun to learn about things on the other side of the world. I love this series you are doing. Can't wait for more. Thats really interesting, I think its especially cool that the Tweed is protected by an act of Parliament. Can't wait to learn more about how its made! Harris Tweed Bags, and a.... Giveaway!